Anyone who says that the desert “is an ugly, dull place!” has never been through it during a super bloom spring. which are the real sign that spring is here for us desert dwellers. 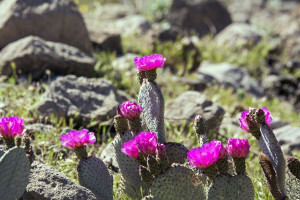 “Pink” prickly pear is a easy growing plant that grows bold pink flowers starting in the spring. It grows about 12″ high and normally about 18″ wide but this year is a super bloom and we are getting larger than normal plants. We drove through the Lake Mead Recreational Park and stopped at some of our favorite places to chase butterflies and lizards running around the foliage. Then heading out to the Red Rocks we were surprised to run into a small herd of wild mustangs and get some great shots of them before hiking around the red rock formations looking for interesting things to photograph. Finally spending some time at the Rogers Springs to shoot some video and enjoy the small but beautiful surprise the desert gives once in a while…a pond\waterfall with flowers abounding! With covered picnic tables and palm trees just a short walk from the road and all overlooking Lake Mead in the distance! It was a wonderful way to enjoy our beautiful desert on the first weekend of spring!